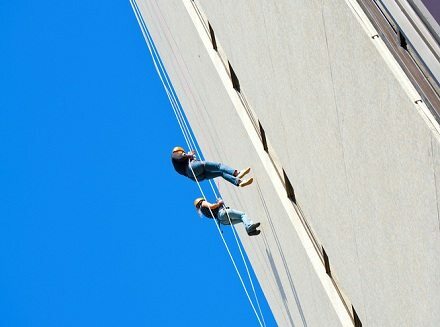 Last Friday and Saturday, more than 150 people rappelled down the side of a 32-story building to raise $230,000 for a Denver cancer charity. Here’s what gets us: according to the article, “many participants were first-time ‘rappellers’ and described an adrenalin-pumping feeling of vertigo.” Stephen Mideks participated to honor a friend who died of cancer. “The most challenging part of the process is that initial lean back over the edge of the building,” he said.